I'll have a random, you're only 559 miles away. The bonnet doesn't want to open. It opened fine before, although there is a small piece of front grille missing hinting at previous problems. Any advice from omega gurus before I go an force/break something? Get someone to lean on the bonnet while you pull the release handle. This raffle has as much traction as an Oldsmobile in the snow, but I'll drag it up from page 5 as it's mot time tomorrow! It's going to fail. The question is, how badly? I got the bonnet open thanks to the 'press down on the bonnet' tip and charged up the battery. It started before it had completed one revolution of the engine. Nice! With the pigeon crap washed off it is looking lovely, barely a blemish on the paint work. I'll get some daytime pics asap. Drives smooth and quiet with no knocks, bangs, clunks or squeals. The interior is very clean, only let down by the peeling finish on the centre of the steering wheel and some of the heater control buttons. Black leather* upholstery and wood* trim. This isn't the car for the powerfully built middle manager. This is the company director's wheels. Heated seats with 5 settings, mmm cosy. Digital dual climate control, mmm posh. The V6 sounds eager and yet ... refined. Feels more responsive than the 200bhp S60. Not sure if it's real or imagined, maybe the gearing, or maybe because the Volvo needs revs. I had forgotten how nice it is to drive, but then I only had it a week before buying four cars in a wild auction frenzy one evening, and the omega has languished in the shed ever since. -The tyres are shagged. They're 10 years old and badly perished. -There doesn't appear to be a locking nut socket. I've checked every nook and cranny. -The airbag light is on. Seems to have been an ongoing issue going by the bill for £275 in 2013 for a the supply and fitting of a new airbag clock spring. Mentioned in subsequent mots. -Mot advisories keep mentioning corroded brake pipes. They must be getting 'fell roosty' by now. -I'm going to have to apply for the v5. -The dual climate control works fine on the passenger side but blows cool on the driver's side. We'll see what the mot man says, but there's a fair chance it will cost more than the £350 to mot it, in which case I'd be as well putting it back into hibernation until I can use it and at which point it will be worth fixing. Whoa! Stop buying tickets! Raffle on hold! 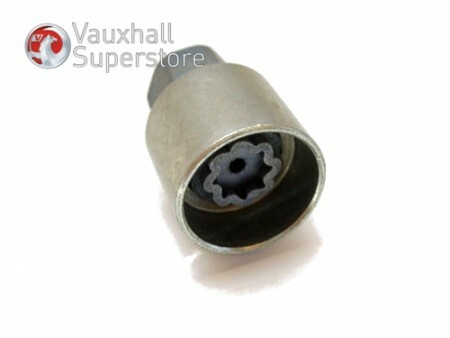 What flavour of locking nuts are they? The chisel-and-hammer-a-socket-on type? If it has an MoT I'm still in for a roffle. Even if the ticket price goes up a bit. 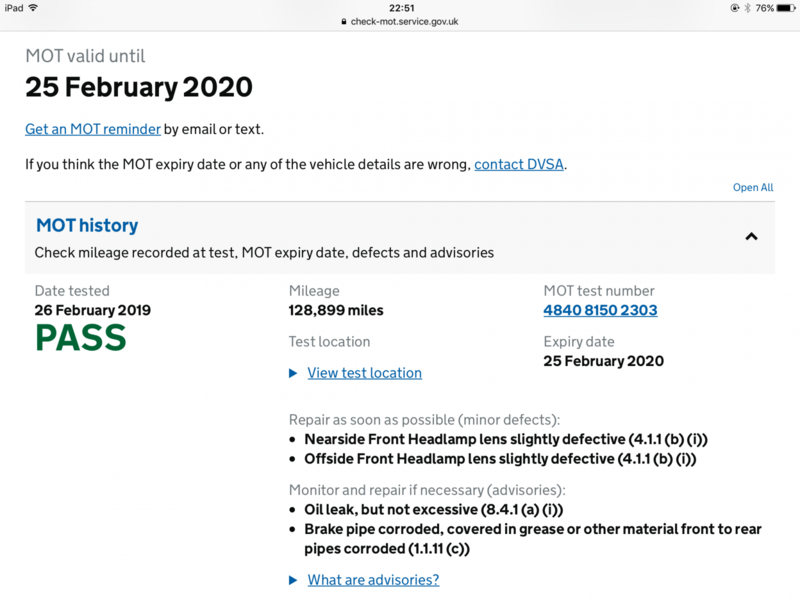 The mot news is in and it's a Valentine's Day BFF (big fat fail). Not as bad as it might have been. Tyres I knew were old although I hadn't noticed the inner edge was worn down so much. Airbag - I'll try a diagnosis of. Wiggling the wires under the seats made no difference. Fuel leak - I'll investigate tomorrow afternoon. A bulb and the lenses need a scrub. I just need to decide how much to spend on tyres and determine if there's still an appetite for a roffle. Still a roffle appetite here. Bung some partworns on it from your local friendly vendor. I’ll confess to looking up the MOT yesterday but didn’t want to steal your thunder/rain parade etc. As for roffle, like the time I saw my first ‘proper gf’ 20 years and 2 kids later, still would. The airbag light is fixed*. I'll look into new tyres tomorrow. What size of tyres does it require? Unfortunately I don't have any 16" tyres going spare. Locking wheel nut with spinning collar defeated. Put me down for a random. Plastic clip connecting the metal return fuel pipe to a short piece of plastic pipe was leaking. The pipe was corroded into the clip so I lost the heid and broke it. I dropped the tank and fitted some new hose between tank and pipe. Just tyres to sort out. 225/55/16 must be an unusual size as nobody had them on the shelf. I had to get them yesterday as I was running out of time for the retest. After a dozen phonecalls, I ended up with a choice of part worns in Stirling or the same in glenrothes. 1hr30 v 1hr15 each way, so Fife won. Chuck's Tyres had a pair of michellins and a pair of Goodrides. Whole afternoon spent getting these. Then today, an mot pass. Bravo Sir, I think three more roffle tickets for me please! So, having bought this for £350, driven it for a week, stored it in a rented shed for 18 months and now spent £230 getting a year's ticket, I'm selling it for £350. Am I doing this right? I'll probably tax it and drive it about while this roffle gestates like a blue whale. Or a white elephant. The brake pedal travels a bit. Maybe a bit spongy? On a positive note, they're not fierce. The dual climate control doesn't blow hot on the driver's side. To heat the cabin I set it to vent only and closed the driver's vents, letting the passenger side do the heating. Bit of a hot oil smell off the engine. Apparently TADTS. There's a receipt for £308 for the fitting of a new rocker cover gasket and tube seals 8000 miles ago. I'm not convinced it worked. After an extensive search, I found some rust on the bottom edge of the rear near side wheel arch. 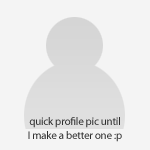 Pic to follow.